Congratulations on finding and ordering golf instruction from one of THE BEST golf instructors on the planet! If you ordered the DVD version, your order is being processed right now and will be delivered via U.S. Mail. You will also receive login information to watch the videos online right now if you prefer. If you ordered the online-only version, you will receive the login information in email right away. With both versions, I will also be sending you the BONUS: 6 months membership to my GolfSelfHypnosis.com mental game training website. Login information will also be sent to you in email for that as well but it may take up to 48 hours since this is hand entered by my team. The great thing about following Brian Mogg’s instruction is you can be sure IT WORKS! 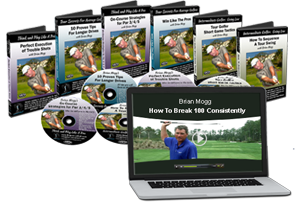 His students, from weekend golfers to top pros, have found consistent success from implementing his very simple and easy methods. If you ever have any problems, you can reply to any email I send you or go to the Contact Form on this site. I look forward to reading your email to me telling you how your scores are dropping and how much you are enjoying the game of golf! Please do tell us!